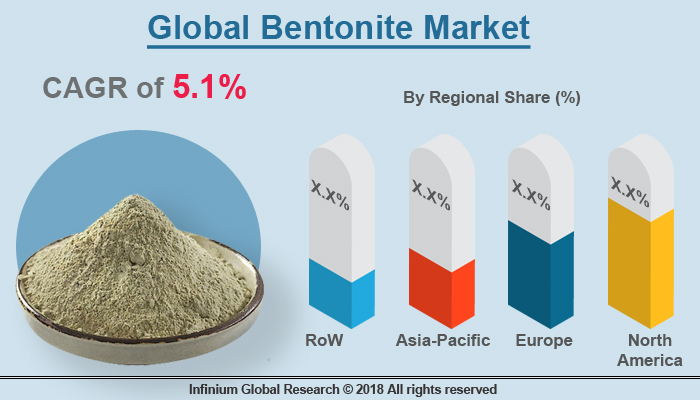 A recent report published by Infinium Global Research on bentonite market provides in-depth analysis of segments and sub-segments in global as well as regional bentonite market. The study also highlights the impact of drivers, restraints, and macro indicators on the global and regional bentonite market over the short term as well as long term. The report is a comprehensive presentation of trends, forecast and dollar values of global bentonite market. According to the report, the global bentonite market is projected to grow at a CAGR of 5.1% over the forecast period of 2018-2024. Bentonite is a commercial name for the naturally occurring clay that predominantly consists of montmorillonite. Bentonite is formed from weathering volcanic ash. The bentonite has high water absorption capacity that causes it to expand and swell. The bentonite has different types, depending upon the respective dominating elements including potassium, sodium, aluminum, and calcium. The swelling action or absorption of bentonite is depending on it’s the ion exchange capacity. The most common use of bentonite is in drilling fluids. The bentonite in the flush fluid lubricates and cools the cutting tools while protecting against corrosion. Combinations of water and bentonite can perform a multitude of functions in the industry including drilling, binder, purification, absorbent, groundwater barrier and many others. Growing consumption of bentonite in the industrial applications is the key factor that drives the growth of bentonite clay market. In addition, the rapidly mounting demand of bentonite from various end-use industries such as construction, paper and pulp, Agriculture, Ceramics, Food industry, Pharmaceuticals, cosmetics, and others are likely to escalate the growth of bentonite market. In the agriculture, the Bentonite is used as an ion exchanger for soil improvement and conditioning. Bentonites play a vital role in the formation of wine, edible oils, and fats as it removes impurities in oils, and enhance clarification and protein stabilization. Furthermore, Bentonite is significantly used in the metal casting and foundry applications. The rising metal casting and foundry applications coupled with the growing automotive industry are anticipated to boost the demand of bentonite market. Moreover, growing use of bentonite in the cosmetic, water treatment and personal care products is projected to create several growth opportunities for the bentonite market. The awareness about the wastewater treatment is rising the demand for bentonite is also increased as it has high adsorption capabilities, and they are easily available with low price. Regionally, North America holds the market share in the bentonite market owing to a large number of exploration and drilling activities. The strict government regulations regarding drilling activities among the North America region is hampering the growth of the bentonite market that may further affect the market growth. In addition, Asia Pacific is the fastest growing region in then bentonite market and expected to be the leading market in upcoming years. Growing consumption of bentonite across various end-use industries including construction, Oil and gas, cosmetic, food industry and many others are driving the growth of the bentonite market. The growing cosmetic and personal care industry in the Asia Pacific region is contributing to the growth of the bentonite market. The report on global bentonite market covers segments such as product and applications. On the basis of product, the global bentonite market is categorized into sodium, calcium, sulphur, and others. On the basis of applications, the global bentonite market is categorized into foundry sands, pet litter, iron ore pelletizing, drilling and others. The report provides regional analysis covering geographies such as North America, Europe, Asia-Pacific, and Rest of the World. In this section, the key trends and market size for each geography are provided over the period of 2016-2024. The countries covered in the North America region include the U.S., Canada, and Mexico; while the Asia-Pacific region includes countries such as China, Japan, India, South Korea, Malaysia, and among others. Moreover, Germany, U.K., France, Spain, and Rest of Europe are the major markets included in the European region. The U.S. drives the growth in the North America region, as it is the largest market in the region. In the Asia-pacific region, rapid industrial growth in India and China offer a substantial potential for the growth in the bentonite market. As a result, the APAC region is projected to experience a growth at a CAGR of x.x% over the forecast period 2018-2024. The report provides profiles of the companies in the global bentonite market such as Minerals Technologies Inc, Clariant, Imerys, Bentonite Performance Minerals LLC, Ashapura Group, Wyo-Ben Inc, Delmon Group of Companies, and Black Hills Bentonite. The report provides deep insights into the demand forecasts, market trends, and micro and macro indicators. In addition, this report provides insights into the factors that are driving and restraining the global bentonite market. Moreover, The IGR-Growth Matrix analysis given in the report brings an insight into the investment areas that existing or new market players can consider. The report provides insights into the market using analytical tools such as Porter's five forces analysis and DRO analysis of bentonite market. Moreover, the study highlights current market trends and provides forecast from 2018-2024. We also have highlighted future trends in the bentonite market that will affect the demand during the forecast period. Moreover, the competitive analysis given in each regional market brings an insight into the market share of the leading players. This report will help manufacturers, suppliers, and distributors of the bentonite market to understand the present and future trends in this market and formulate their strategies accordingly.